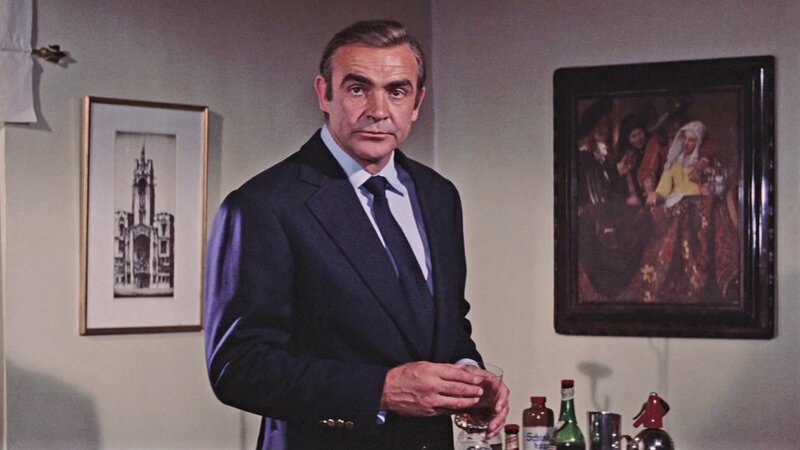 On a number occasions, Sean Connery’s JamesBond wears single-breasted navy blue blazers made by Anthony Sinclair, his usual tailor of Conduit Street in London. The navy blazer—as per the definition of a navy single-breasted or double-breasted jacket with metal buttons—has long been a staple of the classic Anglo-American wardrobe. The jacket’s origins are in England, from the double-breasted naval uniform and from the single-breasted blazingly striped boating blazer. Today the English do not favour the blazer as much as the Americans, who will wear them on just about any occasion, casual or formal, business or social. Nevertheless, the blazer is a classic garment on both sides of the Atlantic and a staple of Sean Connery’s James Bond wardrobe. Sean Connery wears three similar blazers in Dr. No, Thunderball and Diamonds Are Forever. 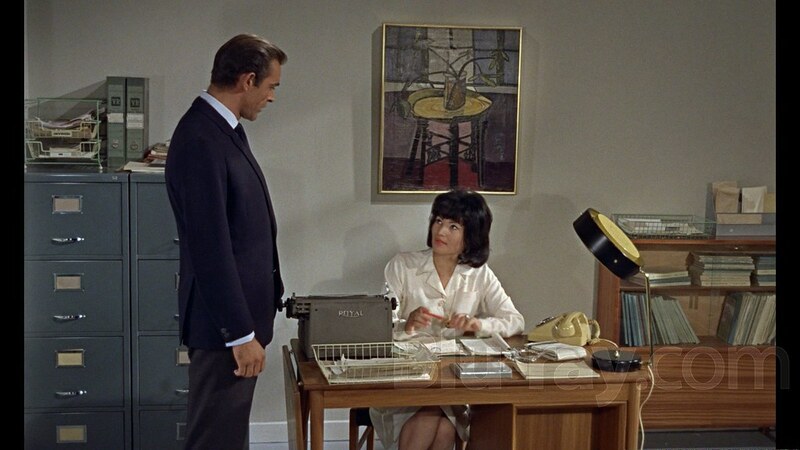 The three blazers are so similar, especially in Dr. No and Thunderball, that they could almost be seen one garment that returns, and it follows that they should be discussed as one garment. The blazers are made of navy blue wool doeskin, a densely napped woollen flannel with a bit of sheen. Doeskin is woven in an even twill weave, but the weave may or may not be visible through the nap. It’s best for cool weather, but seeing how Bond also wears a flannel suit in Jamaica in Dr. No, a doeskin blazer wouldn’t be out of the question for him in both the warmer and cooler climates. We are to think that Connery’s Bond has one blazer, made for his home climate, that must make due wherever he travels. Doeskin wool also gives Connery’s blazer a sporty look while also making it something different from a standard smooth worsted suit jacket. A sophisticated blazer is more than just a navy suit jacket with metal buttons, as is commonly seen in examples off the pegs. Connery’s blazers all have a button two front, the same as his suit jackets. They are cut with soft shoulders, roped sleeve heads, a full chest, a nipped waist and a low button stance. The blazers have double vents in the English tradition rather than the single vent that typically adorns the American blue blazer. Connery’s blazers have the sporty detail of three open patch pockets: two at the hips and one on the breast. The three blazers have minor differences. The lapel width in Diamonds Are Forever is the most significant difference in the three blazers. The Dr. No and Thunderball blazers have narrow lapels—with slightly different shapes—while the blazer in Diamonds Are Forever has wide lapels. The blazer in Diamonds Are Forever also has the sporty detail of swelled edges, where the lapels. front edges and pockets are sewn away from the edge. The blazers’ quintessential buttons differ as well. The buttons in Dr. No are gunmetal while the buttons in Thunderball and Diamonds Are Forever are unpolished brass. In Dr. No there are only two buttons on the cuff, whereas there are four buttons on the cuffs in the later two films. In all three films Connery wears his blazer with dark grey flannel wool trousers. 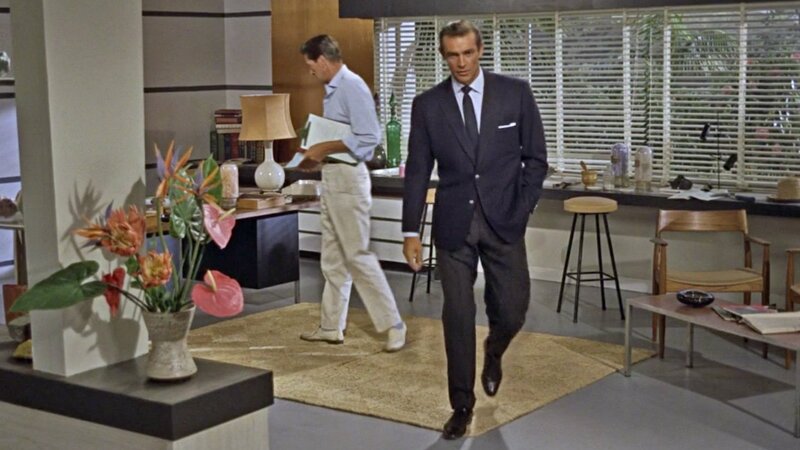 The trousers in Dr. No and Thunderball have double forward pleats and turn-ups while the trousers in Diamonds Are Forever have a darted front and plain, slanted hems. All of the trousers have an extended waistband with a hook-and-bar closure, button-tab “Daks tops” side-adjusters and narrow tapered legs. 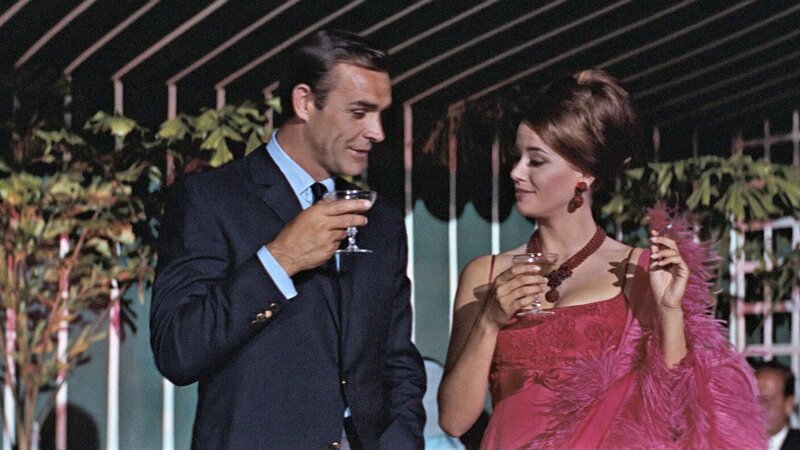 The shirts that Bond wears with the blazers are light blue poplin in Dr. No and Diamonds Are Forever and mid blue poplin in Thunderball, all from Turnbull & Asser. The shirts have a cutaway collar in Dr. No and spread collars in Thunderball and Diamonds Are Forever. All three have cocktail cuffs and a front placket. He always wears the blazer with a navy grenadine tie, in widths that match the lapels. 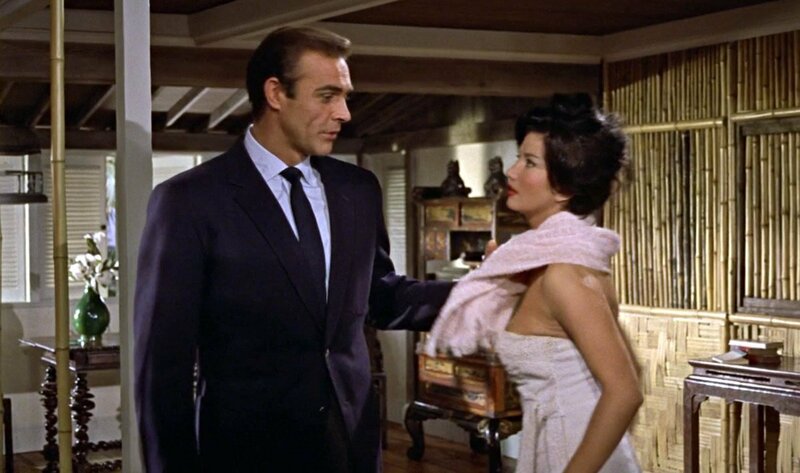 Dr. No and Diamonds Are Forever Bond ties it with a Windsor knot while in Thunderball he ties it with a four-in-hand knot. In Dr. No he also wears a white linen pocket square. He always wears it with black shoes. In Dr. No the shoes are three-eyelet cap-toe derbys. 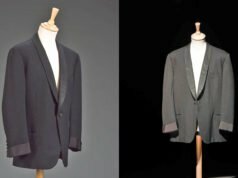 The navy blazer is a versatile piece of a man’s wardrobe, and in the three films James Bond shows how flexible of a garment it is. Bond wears it for both informal business and for social occasions. 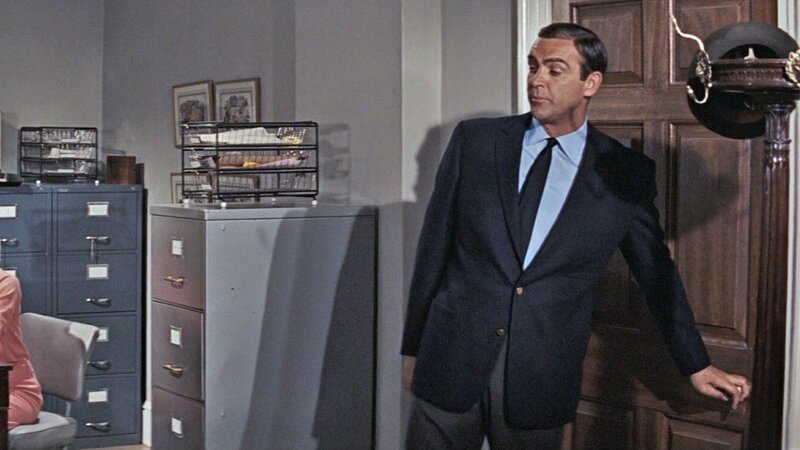 In Dr. No, Bond wears the blazer for an inquisitive visit to Professor Dent’s laboratory, where he looks professional without looking as if he is dressed for a London meeting. Later in the film he wears the blazer socially for a date with Miss Taro. 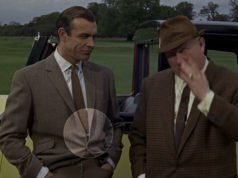 In Thunderball, Bond puts on the blazer and a herringbone topcoat with a brown trilby hat when he’s leaving Shrublands in the English countryside for an important last-minute meeting at Universal Exports in London. Bond would not ordinarily wear a sporty blazer for an important meeting, but Bond likely did not bring a city suit with him to Shrublands. The blazer is the dressiest garment he likely brought with him to the country, and it works in a pinch for his important meeting because the navy blazer is in a formal city colour. Bond’s dark grey (another city colour) trousers dress up the blazer more than any other trousers would. The blue blazer with grey trousers is only about half a step in formality below a two-piece city suit. For his next meeting in London, Bond is more properly dressed in a brown mohair three-piece suit. Bond later wears the blazer and flannel trousers socially in the Bahamas at the Junkanoo parade. In Diamonds Are Forever, Bond wears his blazer for an informal business meeting at Tiffany Case’s flat. Here it gives Bond, posing a Peter Franks, a softer and friendlier look than a dark business suit would, but it still gives him a professional appearance. Later on, Bond wears a grey glen check suit for a similar approach. Of note is that the sleeve buttons aren't spaced like a lot of '60s coats had. Jovan, I think the wider spacing of the two cuff buttons in the 60s was probably an American thing. Did Bond ever wear a double-breasted blazer? Lazenby, Moore and Brosnan wore double-breasted blazers on occasion. I'll soon cover them. What do you mean in your text when you refer to blazer buttons: "brass and brass" – do you mean twice the same i.e. in both films bothtimes brass? That line refers to the three films mentioned before it, thus I wrote respectively. There are three blazers, so I had to write three descriptors, even though two are the same. I hope this clears things up. Connery wears a single breasted navy blazer with grey trousers in Nassau (in the evening with Domino) . Is the same wore in London briefing before that he starts for mission? Yes, the outfit is the same as the one shown in the middle image. I’m interested in the gunmetal buttons. Would you say they are plain, textured or with some sort of crest? Did Sean Connery’s blazers in all the three movies have three patch pockets in the front part of the blazer? i.e. two near the hands and one near the heart? Yes, all three are like this. Are the buttons on the Diamonds are Forever blazer a distressed and dull brass? Are they domed or flat? Thanks Matt. Could this look be done in tropical settings if the the trousers were tropical wool and the blazer was in a hopsack or lightweight serge or even tropical wool with sporty details? Absolutely! A hopsack blazer and tropical wool trousers can work very well in the tropics. Precisely as I thought as well Matt! Thanks for the immediate response! If the navy blazer though was in tropical wool but has sporty details could it work well with dark grey tropical wool trousers? It can work, but there should ideally be a textural difference between the blazer and trousers. The trousers in DAF look very dark, they could even be closer to charcoal really. Charcoal is a form of dark grey. 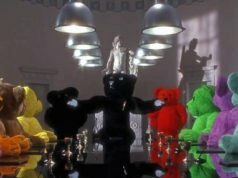 It’s very difficult to tell the true colour of the trousers from the film because it has very high contrast. Behind-the-scenes photos show different shades of grey. In a lot of photos of me, my charcoal trousers look almost black.